It’s been quite some time I haven’t been in Prague. Actually last time was in 2007. I was still a student at the time, we went there for three days, and we basically spent the weekend drinking. Didn’t go back there since then, however once I got there I realized I still had vivid memories of the city. Just a few hours after getting there, walking down the streets of Prague, places and streets came back to me. I even recognized a club we went to at the time! First off, I quickly noticed that I’m actually in Eastern Europe. Prices are way lower than in Munich, my purchasing power is a lot better and it’s possible to have a good meal for the equivalent of a few euros. It’s hot outside, a little too hot, but I prefer this to a freezing weather. I went there in May, but here’s a guide if you wanna know when is the best time to visit Czech Republic. Anyway, seated on a bench in the street, I saw an impressive number of beautiful Czech girls parade in front of me. Oh yeah… I’m in Eastern Europe! And people know how to party here! There’s always activity outside, lots of bars open ’til very late, music… Oh and I almost forgot… I’m getting in a part of the world where the black man can be “exotic”. Little kids keep staring at me in bewilderment and with surprise. But no animosity at all. It’s time to get to know Prague again even though it’s scorching outside. My hostel was ideally located next to the city center. Therefore, I didn’t have to walk for a long time to see the Church of our Lady before Tyn, which is on old town square. Initially the two towers were supposed to be identical but they messed up during the building and one the tower is slightly taller than the other one. Next to the church, still on old town square, is located the very famous astronomical clock. Very popular clock, people bunch up as they approach the clock to take a picture. We need to remember that this clock was built during the 15th century, and it’s still here today. Every hour, there’s a little animation. The skeleton rings the bell and we can see the twelve apostles parade slowly. Nobody wants to miss that! Not far from old town square is Josefov, the Jewish area of the city. In Josefov, you’ll see synagogues (of course! ), a Jewish museum and the old Jewish cemetery. It is the largest jewish cemetery in Europe. The cemetery allegedly exists since the 15th century. This explains its popularity, a lot of people were in front of it to get in. I crossed the Vlatva river, taking the famous Charles bridge. Packed with tourists, musicians, street peddlers, selfie sticks… Unlike most people, I didn’t stay there, and I headed to the John Lennon wall. Originally it was a regular wall but since the 1980s, it became a wall filled with graffiti and some lyrics from the Beatles’ songs. It’s more or less a memorial to John Lennon (not the same style as the memorial to Michael Jackson in Munich). 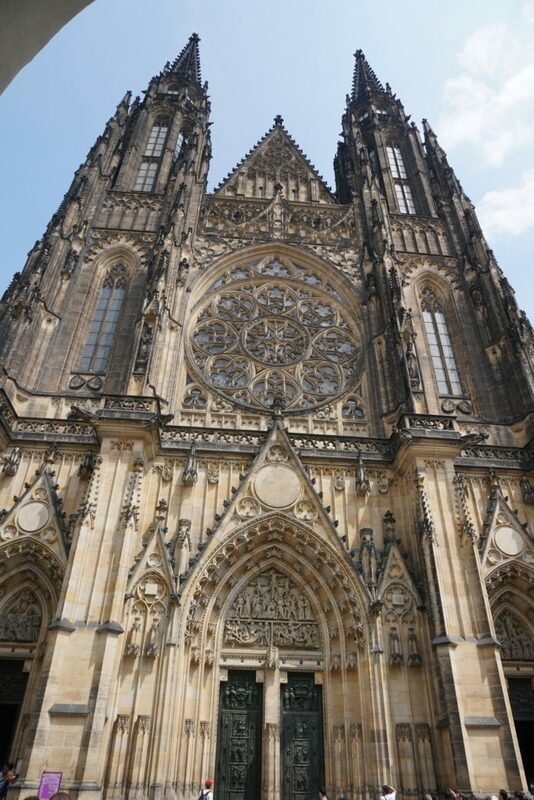 I also heard about the Prague castle, and I didn’t remember going there during my last trip in Prague. Time to czech it out! The castle is located in the heights of Prague. Your legs are going to work to climb up there, and there are a lot of stairs (good way to stay in shape!). But it’s worth it, because the castle is stunning. And right behind the castle is the imposing St. Vitus Cathedral. Behind the castle, you’ll find a street called “Golden Lane“. It’s called Golden Lane because during the 17th century, goldsmiths used to live there. Some people think they’re going to see a street full of gold, houses, etc… That’s definitely not the case! For your information, in theory you have to pay to be able to access this street. In fact, if you go there after 5pm, it’s free. From the castle, we can see far away an imposing tower. It’s the Petrin Lookout Tower, and some people say it’s a replica of the Eiffel Tower. This tower is on a hill too, therefore it looks higher than it actually is. Once I got there, I was told it’s possible to get on top of it, either by foot (150CZK, around 6 euros), or using the elevator (210CZK, around 8 euros). Let’s climb the stairs! On top of the tower, we have a view of Prague. Hmmm… I think I saw the most important things in Prague. Oh no… A little further. An uncommon building! The dancing house, which takes this name because it represents a couple dancing. Not bad… Going back home, I took Wenceslas square, a famous avenue in Prague with a lot of shops. I stopped by a cafe, and I ordered a well-deserved beer. “Ahoj dvie piva prosim!” (“Hello, two beers please!“). A czech guy taught me this because “when you go to a bar in Czech Republic, you never order just one beer“.He’s not wrong, 50CZK for a beer (2 euros, 2 US dollars)! It would be a shame not to take advantage of such low prices! Talking about beers, I heard there was a few beer spas in Prague. Never did that before. Why not test it out? Are you going to Prague or Czech Republic? Do not leave home without a travel insurance! You have plenty of options when it comes to accommodation, and for all budgets. Booking has the largest inventory, otherwise there’s Hostelworld, specialized in hostels. Visit of the Prague castle, of the old city, dinner on a boat, clubbing… There are many things to do! If needed, get a city guide !